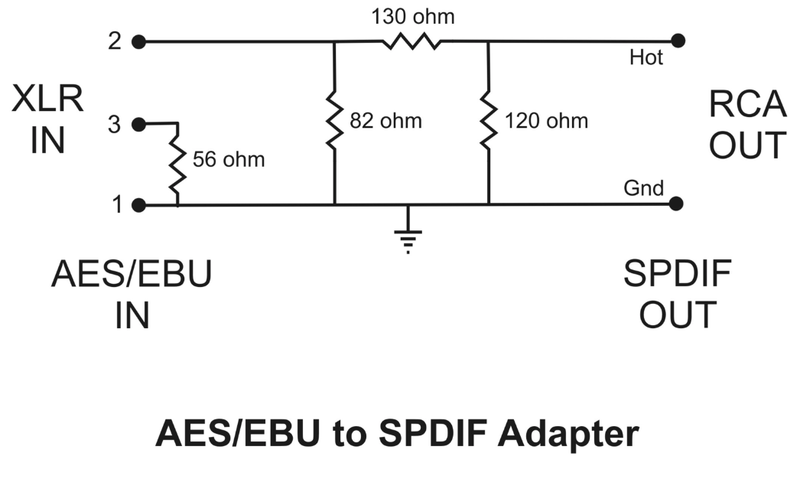 My DAC uses the attached input schematic for S/PDIF signals. What would be the correct resistor value(s) for AES/EBU signals? Thanks! My DAC uses the attached input schematic for S/PDIF signals. What would be the correct resistor value(s) for AES/EBU signals? Thanks, does this mean I cannot simply change resistor values here but have to add a voltage divider? Do you know the ratio of the transformer? Probably around a 1:2 to match the impedance and also increase the spdif level. So a pad would probably be necessary when using aes level signals, as you wouldn't want a step up for them. I'm pretty sure the one I've got is a 1:1 transformer, since I took it out of an old converter's AES/EBU circuit. And I think the circuit drawing of my current converter calls for a 1:1 transformer as well. I tried both professional and consumer level from the AES output (RME cards allow you to change this) and both work with the converter's input. But I'd rather have the correct circuit for AES/EBU. I was hoping to get away with using a different resistor for the 330R one. My guess was 1:2 based on the 330, as that would give 330/4 or 82.5 load, which is close to the 75 used in spiff. What is down stream impedance after the 330? If it's really 1:1 transformer than a simple 110 ohm would probably be ok. Or something a little larger than 110 to account for the down stream load that is in parallel. Thanks! I'll try next week and report back. Merry Christmas! AES/EBU is usually Balanced vs. S/PDIF Unbalanced, some "professional" video equipment has unbalanced AES/EBU like Matrox MXO2 Rack for example but its rare, usually is Balanced. that can create signal reflection problems "cancelations" at some points of the cable. the ETSlan.com PA-813 are a small balun "transformer" and also H-Pad -10dB. they work well, but if you replace the ground wire with a better AWG24 from Proel or Belden would work better. with litz wire, or single strand very small AWG between 30 & 40.
turns are also very small, like 5, less than 10. 1 ground AWG24 wire, done. Stereo AD/DA with S/PDIF or AES-EBU needed. Evaluation boards any good for this?